Mercury mayhem has been continuing here. Temperatures have been touching all time low. Yesterday, the day started on a beautiful note. The horizon was clear, the sky was blue and the birds were chirruping in high notes. All days are not the same. Yes, the Sun peeped majestically from behind the hills and shone brightly…..the Sun rose steadily, and, so did our spirits that were almost dampened by the fog. All the pending chores gained momentum….the washing machine whizzed merrily, a trip to the market was planned…. The usual hustle bustle seemed to return after a long time. Cold weather also interferes with my bread baking. It had been a long time since I had baked bread. The warm morn was the best time to start working on one. 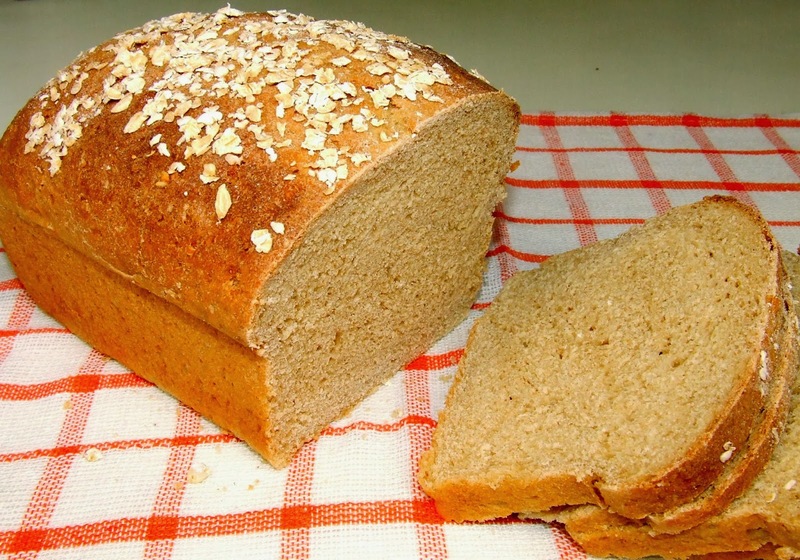 I baked a Whole Wheat Oats Bread which we had for dinner next day. 1 ½ cups + 1 tablespoon warm water. Add sugar to warm water, take 1 cup of this warm water and add yeast. Cover for 15 minutes. Whisk together whole wheat flour, oats, and salt. Add olive oil and mix well. Add yeast mix to flour mix, kneading well. Keep adding remaining water in parts. Stretch the dough with the heels of the palms and knead till a smooth and supple dough forms. This requires a lot of muscle power. Knead for about 8 to 10 minutes. Transfer the dough to an oiled bowl, cover and keep the dough for 20 minutes. Remove the dough from the bowl to the kneading plate and knead for another 6 to 8 minutes. Grease one 7 inch x 3-inch loaf pan. Roll out the dough into a rectangle not bigger than the width of the pan you are using. Roll the dough towards you, tightly. Pinch seams to seal. Place the roll in the greased loaf tin with the seam side down. Cover and keep it to rise for 1 ½ hour in a warm place. Bake in the preheated oven at 190 degrees C for 25 to 30 minutes or till the top turns brown and the bottom of the pan sounds empty when tapped. If the loaf is browning too quickly, tent the loaf loosely with a foil. Remove from the loaf tin after 10 minutes. Cool in the rack. 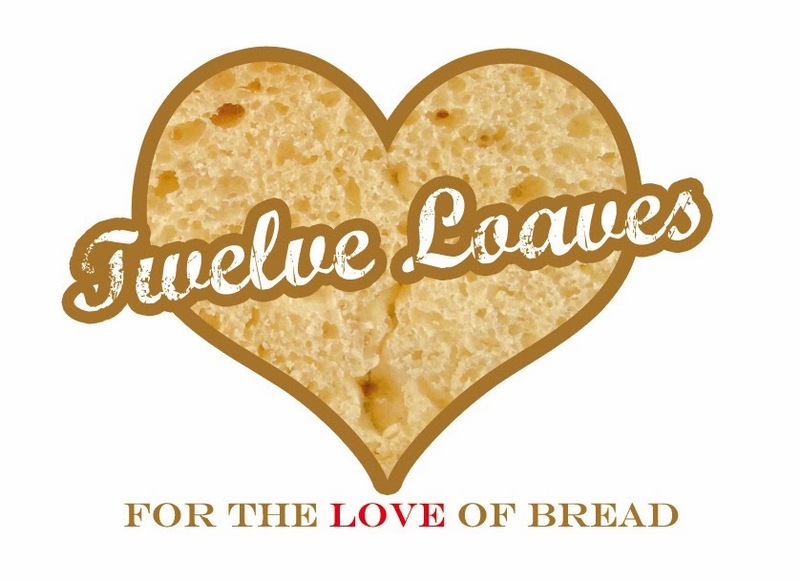 #TwelveLoaves is a monthly bread baking party. It was created by Lora from Cake Duchess and runs so smoothly thanks to the help of the lovely Paula from Vintage Kitchen Notes and Renee from Magnolia Days. Hi Namita which yeast do you use? I use instant dry yeast which is quite dependable. It is also easy to store. Love that height. Amazing bake. I am yet to put my hands on a wholewheat bread. This looks very inspiring. Love your breads. 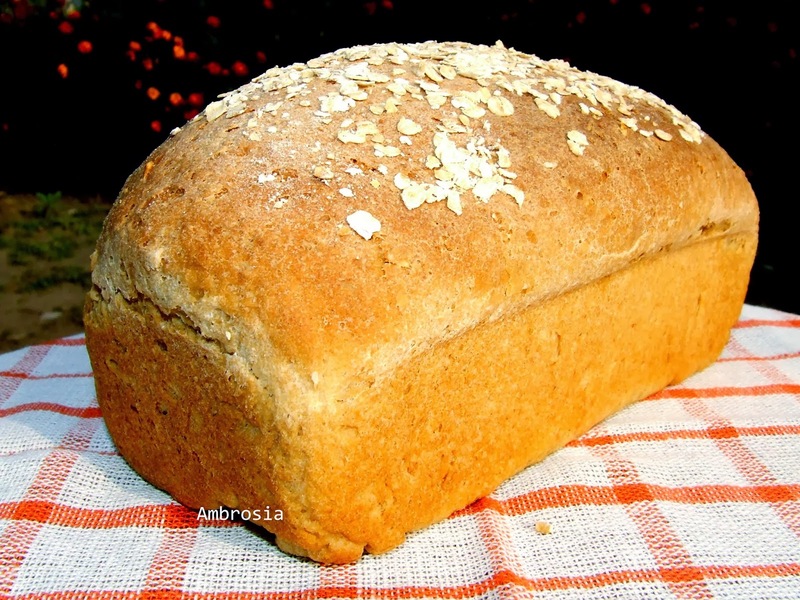 Right now, I was looking for breads since I am on a diet that says no processed foods. I found all that I needed in your blog. You rock Namita. Hi Namita, your receipes are awesome. I am trying some of your recipes. I have a 9 x 4 inch pan, can I use that for your bread recipes. Does it make any difference? thank you for visiting my blog and for your kind words. Yes you may use a 9 x 4 inch pan you will get a better shaped loaf.Happy baking! Thank you fou your prompt reply Namita. 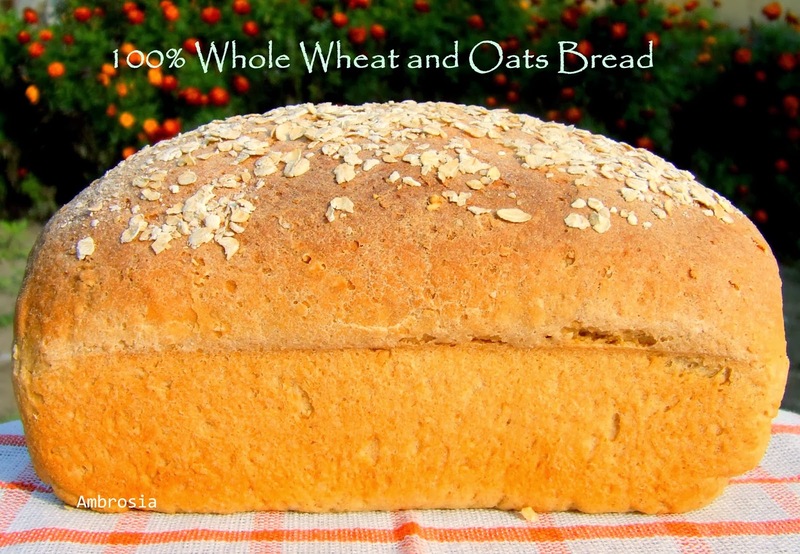 I tried this wholewheat oats bread, unfortunatety didn't get a good result. The yeast frothed so well, and the first rise was really amazing, but the second rise in my 9 x 4 inch was not good. It did rise but only upto the top of the pan. I thhough it may rise again in the oven but it did not. I am wondering where it went wrong. Should I be using a small pan? or is it any other reason for not rising well in the pan?